Retired November 1, 1949. Died October 26, 1971. 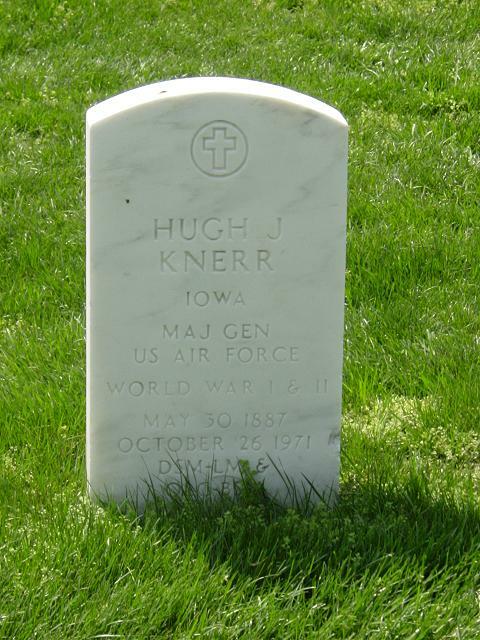 Hugh J. Knerr was one of a small group of airpower advocates who helped keep alive and to expand on General "Billy" Mitchell's theories of air warfare. For three years, from 1927 to 1930, he was commanding officer of the 2d Bomb Group - and as such, was in general charge of development of bombardment tactics in the Air Corps. When Air Corps Chief Major General Benjamin D. Foulois asked Lieutenant Colonel "Hap" Arnold to lead a squadron of new B-10s on a pioneering round-trip flight from Bolling Field to Fairbanks, Alaska, Major Hugh Knerr was assigned as Arnold's executive officer. Between July 19 and August 20, 1934, the two led the 10 B-10s on their 18,000 mile test during which they photographed some 20,000 square miles of Alaskan territory, providing data that was useful later in World War II. As early as 1928 Knerr had recommended development of two new monoplane, multi-engined bombers - one type with high speed, strong firepower and short range, and one long-range bomber, with heavy load capability. The Boeing B-9 and the Martin B-10 and B-12 were outgrowths of these and other requirements as seen by Knerr and other Air Corps professionals. As the Air Corps' leading expert in bombardment tactics, Knerr had helped develop the requirements list in 1933 that called for future aircraft which would evolve into the B-17 and B-29. And when the first B-17s were declared operational in 1937 they were assigned to General Headquarters Air Force at Langley Field, Virginia, where Knerr was chief of staff. Under Major General Frank M. Andrews, commanding general of General Headquarters Air Force, Colonel Knerr worked for three years to help build the organization, the aircraft, the trained crews, and the bases required for U.S. airpower. Among the Army, Navy and Air Corps the competition for funds and mission assignments was keen, and sometimes bitter. In February 1938 Colonel Knerr was assigned as air officer in the 8th Corps area, Fort Sam Houston, Texas - the same assignment given 13 years before to another crusader for airpower, Brigadier General "Billy" Mitchell. In March 1939 the War Department virtually put an end to the semi-independent General Headquaraters Air Force by reducing General Andrews to the grade of colonel, and reassigning him and his key officers. Colonel Knerr retired that same month, having served more than 30 years. Knerr achieved national recognition during the next two years for his military articles in leading magazines and his lectures about the need for a separate Air Force. In 1942 Knerr was recalled to serve as deputy commander of the Air Force's supply and maintenance organization, the Air Service Command, at Washington, D.C. and Patterson Field, Ohio. A year later, General Carl Spaatz, the great wartime leader of the 8th Air Force, made Brigadier General Knerr his deputy commanding general for administration as well as commander of the 8th Air Force Service Command. As a result, Knerr exercised theater-wide authority over logistical matters - and supply and maintenance won recognition as a function equal with combat operations. Knerr became a major general in March 1944 and was appointed deputy commanding general of U.S. Air Forces, Europe, in June. A year later he was placed in command of Air Technical Service Command, which was reorganized to become the overall materiel and logistics command for the Air Force. General Knerr's last three years of service to the Air Force were at the very highest levels. He served on the Joint Strategic Survey Committee in Washington; as special assistant to the commanding general of the Army Air Forces, General Spaatz; as secretary general of the Air Board; and as special assistant to the first secretary of the Air Force, Stuart Symington. In June 1948 General Knerr became the U.S. Air Force's first inspector general. He retired, for the second time, in October 1949. Hugh Johnston Knerr was born in Fairfield, Iowa in 1887. He graduated from the U.S. Naval Academy in 1908 and served as an ensign in the Navy from 1908 until 1911, when he transferred to the Army as a Second Lieutenant. For the next few years he served in various assignments as a mechanical engineer and materiel officer. He attended the Aviation School at San Diego in 1917. He was commanding officer of the 88th Observation Squadron and later the 5th Division of Air Service at Wilbur Wright Field in Fairfield, Ohio from February 1923 to August 1925. Knerr attended the Air Service Tactical School, the Command and General Staff School, and the Army War College. Hugh Knerr's great technical knowledge, his command flying experience, his loyalty to his organization, and his dogged determination made him an officer that the Air Force's top leaders - generals Andrews, Arnold and Spaatz - depended on in building and running the air arm of the turbulent thirties and the wartime forties.